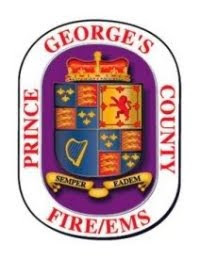 The Prince George's County Fire/EMS Department was pleased to serve as co-host rest stop for the National EMS Memorial Bike Ride on Friday, May 20. The 100+ members of the ride rolled into FedExField in Landover at around 12 Noon. The Redskins were generous hosts and provided a lunch buffet for both building carbs and a healthy lunch. Riders started their journey on May 14 from Boston and ended their ride this weekend in Arlington, Virginia, at the National EMS Memorial. The NEMSMBR is held annually to honor the men and women of EMS that lost their lives in the line of duty in 2015. "Skillet" Ulmschneider was honored with an on-site marker along with his personalized dog-tags being worn by members of the ride. He will receive additional honors during next years ride. Riders arrived through a large inflatable Redskins helmet and were greeted by some of the First Ladies of Football Redskins Cheerleaders. Many rival NFC East fans had the opportunity to visit inside the stadium and capture some photos of the field.